Looking for Senior Engineer C&S. We are looking for people with infra or heavy engineering experience. Interested, kindly share your CV to hasnan@mgjv-kvmrt.com.my. Strictly for Malaysian only. AJ Resorts Sdn Bhd is looking for Accounts Executive with 2 to 3 years knowledge in handling of full sets of accounts. If you are passionate to grow and develop your career with hotel industry, come and join us at AJ Resorts Sdn Bhd. Kindly send in your resume to ylhoh@tanjungsanctuary.com.my ** Only open for Malaysian applicant. keunsu.jeong@samsung.com. atau hubungi terus ke 0123068990..
MMSB is an established multi-disciplinary engineering consultancy. We are currently expanding and would like enthusiastic individuals to assist us in the design & management of our exciting and prestigious projects which include the LRT3 & Pan Borneo Highway. Please email cv to recruit@mmsbconsult.com.my or fax to 03-7874 9600. Dear Candidates, I need pre-commisioning engineer with 5 years of experienced. Interested kindly email to me at rose.ismail@ogassolutions.com Thank you. Hi, we are currently looking for the potential candidate to join our company as marketing executive with experiences in full range of marketing duties . Interested candidate may send resume to my email annfathia@cravitogroup.com or pm for details.. Thank you. Have a nice day peep. Dear All, We would like to invite Fresh Graduates (who are still hunting for a job) to apply for EXIM Bank's Management Trainee Programme for our Operational Risk Department (1 position). Requirements : Malaysian only, Degree holder with CGPA min 3.00 and above. Benefits : Attractive allowance + medical coverage. If you are a talented individual who aspire to be part of our dynamic organisation, please email your CV to recruitment@exim.com.my not later than 21 October 2016 for our consideration (only shortlisted candidates will be notified) Thank you! We are inviting suitably qualified, highly motivated and committed individuals who are keen to build a successful career to join us and be a part of dynamic team at UMW Aerospace Sdn Bhd to be based in Serendah, Selangor. Position : Engineer, Configuration Management E-mail your resume to nor-athirah.muhamed.kamil@umw.com.my thank you! Hi Everyone, MMC Corporation Berhad is currently recruiting for the following positions: 1. Architect (Preferably fresh graduates) 2. Civil Engineering Graduates (To be based in Sabah) 3. Executive, Treasury (Preferably fresh graduates) 4. Senior Executive, Internal Audit 5. Assistant Manager, Corporate Communication If you are interested or know anyone that may be interested. Do apply and submit the resume to me at ariff.ikhwan@mmc.com.my. Thank you! We need a Receptionist to be based at our PJ office - it's a junior role. Main task will be handling local & international phone calls, facilitate visitors and managing some administrative task. The candidate should at least be a Diploma holder, speaks good English & Malay, organized and with pleasant personality (Malaysians or PR only). As Salam. Peluang kerja utk Offshore Safety Officer di Sapurakencana Petroleum Berhad. Kelayakan: Offshore project Safety Experience + Valid BOSIET + valid DOSHGB Holder @ NEBOSH. Kalau ada sesiapa berminat @ ada kenalan yg masih tak bekerja dari sektor O&G akibat kegawatan harga minyak; sila hantar CV pada email saya: radzuan.yusoff@sapurakencana.com. Sekian & Wasallam. Actively hiring for below position:- 1) Payroll specialist (Taiwan payroll) - Shah Alam 2) Sales Support Executive (IT Industry) - PJ 3) IT/Network Engineer (Oil & Gas) - Kemaman 4) Customer Project Engineer (UPS System) - PJ Please submit me your resume to hanna@ingeniousjob.com if you are interested. *Only available for Malaysian. Hiring!! Warehouse Exec | Kapar | Salary up to RM5000 | Good communication in English & Chinese | min 4 years experience | Pls email fiza.basir@hiresolutions.com.my to apply. TheLorry is a fast & easy lorry booking website. A dream to change the world through great user experiences. The excitement to conquer new challenges. The tenacity to work hard to build your dream, one line at a time. Excellent English communication skills, able to write love letters to customers. Passionate in helping companies improve people operations. Bonus: knowledge in HR/PR or Chinese-speaking ability. We are currently on the lookout for potential Local Malaysian talents and job seekers who are interested to join us on our current & future vacancies within our contracts with our esteemed Clients. For individuals who do not appreciate the hassle of bringing all their documents in hardcopies can email us their CVs & related certs beforehand at my-talent@velosi.com with the subject “Position Applied – Talent Sourcing Roadshow 2016” prior to coming and meeting us at specified venues. We will review your CV based on your email submission at the venue. Individuals who are unavailable to come to the specified venue can still email us with their CVs with the same subject header for our consideration. UPS is hiring the following positions (permanent placement) : 1. Marketing Supervisor (Equivalent to Asst. Manager role ) Based In Shah Alam 2. Senior Sales Executive - Based in Shah Alam 3. Brokerage Supervisor - Based in Batu Maung, Penang. If interested , please get connected or drop your CV to hrmy@ups.com. 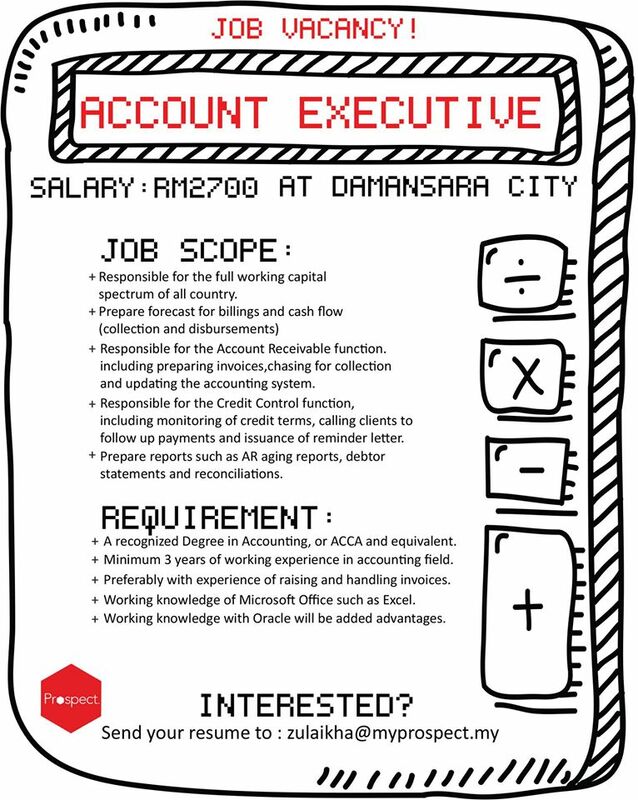 We are currently hiring Malaysians only. Alternatively , you may also reach me at 03-5021 8905. For job description, message me. Good salary package ! Position :- -Tele-Sales Executive Working Location :- -Bangsar Working Hours :- -8.30AM-5.30AM Employment Status :- -Contract for 3 Months (Renewable) Basic Salary : -RM1,600 + Unlimited Incentives Please submit your updated resume to adila@mymillenniumjobs.com or directly call Adilah Aziz-03-2282 8400 for further details. KOPETRO HOTEL & RESORTS SDN BHD Immediate Vacancy: OPERATION MANAGER Requirements - Diploma @ Degree in related field - At least 3-5 years of experience - Well known on P&L matter *position is based on Kerteh, Terengganu Kindly send your resume to hrm@kopetro.com.my ONLY shortlisted candidate will be call for an interview session. Thank you. Tarikh tutup permohonan: 13 Oktober 2016. Alamat : PT 351, Seksyen 25, Jalan Sultan Yahya Petra, 15200 Kota Bharu, Kelantan. Tarikh tutup permohonan: 7 Oktober 2016. Send your resume to jobs@continental-corporation.com to apply. Permohonan hendaklah dibuat melalui borang khas yang boleh didapati di Pejabat Majlis Agama Islam Dan Adat Istiadat Melayu Kelantan atau pengurusan masjid mukim berkenaan. Salinan sah sijil-sijil persekolahan, kad pengenalan, serta surat berkaitan bersama gambar berukuran passport hendaklah dikembarkan bersama borang permohonan. Permohonan yang tidak mengikut peraturan dan lewat diterima tidak akan dilayan. Hi Guys, UMW Toyota is hiring for Executive Brand Building under Marketing Department. The candidates need to have at least 1 or 2 years of working experience in related field. Fresh graduates with good Digital Marketing/ Mass Communication/ Digital Media/ Web Technology background are encourage to apply. kindly email your cv to heffihafizi@gmail.com thanks! Kepada sesiapa yang berminat untuk mengisi jawatan kosong di Rumah Kelab Persatuan Alumni Universiti Malaya, Kuala Lumpur. Our company is looking for a programmer who has worked at least 2 years experience for new project . Please submit your resume to rakna@itspecialist.com.my @ contact us online: 03-87414540.